Buyer’s remorse can feel awful — but you don’t have to live with it. Here are 3 of the most common buyer’s remorse purchases and how you can avoid them. So you spent a small pile of money on something you THOUGHT you wanted — only to realize later you could have gone without it. Congrats! You have buyer’s remorse. It’s not fun BUT there are ways to prevent it. I want to show you how. How do I prevent buyer’s remorse? What if I have buyer’s remorse now? Buyer’s remorse is the feeling of regret you get after making a purchase. Having devoted my life to helping people with personal finance and development, the subject fascinates me to no end. Why do people make purchases that they regret? That’s why I want to go through each of these purchases with you and show you exactly how you can avoid buyer’s remorse for them. Later, I’ll also show you what to do if you’ve already made a purchase you regret. Aside from things like marriage or having kids, buying a house is the biggest decision an average person will make. And yet, I’m amazed at how lightly people approach it when they’ll obsess over things like cutting out lattes to save money. They’ll rush into it without much research or considerations to the alternatives … why? Simple: It’s an invisible script — a guiding belief so deeply ingrained in society and culture that we don’t even realize it’s there. “I’m throwing away my money if I keep renting!” WRONG. People who say things like this don’t take into account the “phantom costs” of owning a home. Those are things like home maintenance and repairs, property taxes, insurance, HOA fees, and utilities that fall on YOUR shoulders to address when you own. Home values may also not rise enough to give you the equity you expect. “I can take advantage of the tax savings!” This doesn’t even make any sense. Even if you deduct a good amount of your mortgage interest from your taxes, you’d be deducting money you’d ordinarily never spend. “Real estate is a great investment.” False. Yale economist and Nobel laureate Robert Shiller discovered that from 1890 to 1990, the return on residential real estate was about zero after inflation. You might have been told that you need to buy a house after college or when you get married. The reality is there isn’t a right time that’s good for everyone. There might never be a time for you — and that’s okay. If you think you really DO want to buy a house though, make sure you check out my articles on how to buy a house and real estate investing myths to make sure you’re making the right decision. One of the biggest reasons buying a car can turn into a HUGE case of buyer’s remorse: People don’t buy for the long haul. Instead, they get caught up in things like how flashy the car will be and how good it looks. They treat a car as a status symbol rather than a way to get from point A to point B. If you want to buy a car you need to prioritize getting a reliable car that you’ll be able to drive for at least a decade. Cars are a long-term purchase. They cost a lot of money. That’s why you’re going to want to get one that lasts a while, since it’s only going to get worse and less valuable over time. Should you buy a used or a new car? 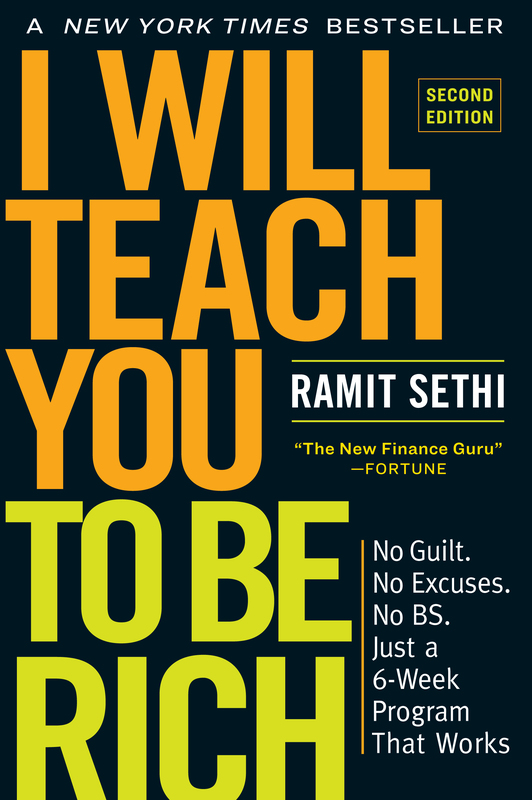 Also be sure to check out this video where I show you how to buy a car the Ramit way. Ah college. The time for questionable decisions, all-nighters with unhealthy amounts of energy drinks, and dorm roommates with weird hobbies. It’s also a time where people find themselves with a massive financial albatross known as student loan debt. In fact, the average college graduate leaves school with about $37,000 in debt. It’s even more than that for post-graduate education. These numbers can seem insurmountable. BUT there’s hope. There’s actually a system to help you pay off your debt painlessly. How? Pay more each month. This might seem counterintuitive, but it’s true. Student loans are huge amounts spread over a long period of time. So you can save significant amounts of time AND money by paying off a little each month. From the chart above, if you pay just $100 more a month, you could save $2,170 on your student loans and shave time off of your student loans. For more insights on paying off your student loans, be sure to check out my video addressing a reader question about just that. Of course, you can prevent buyer’s remorse for college if you don’t have to pay for it. That’s what I did when I developed a system that helped me earn more than $100,000 in scholarships for Stanford. As the adage goes, prevention is better than the cure. And there’s a great solution for if you want to prevent buyer’s remorse: Only spend money on things that you love — and forget the rest. This is also known as a Conscious Spending Plan, and it can help you save money for the things you love and live your Rich Life. I have a friend who leverages this to great effect by spending over $21,000 a year partying and going out. I can already hear some of you screaming from here … but it’s true. Let’s say he goes out just four times a week to dinners and clubs and spends $100 each night (conservative estimate for my friend). That’s $400 a week! At first glance, this can seem ridiculous. However, what you don’t realize is he makes a healthy six-figure salary. He’s also invested a lot into his 401k and his diversified portfolio of investments. So say he makes $210,000 a year net. That means his going-out money accounts for about 10% of his income — which is totally reasonable. If he has the money, and going out makes him happy, why shouldn’t he be able to spend money on it? That’s the same framework you can use when you create your own Conscious Spending Plan. Did you know that the government actually has a law that can help you return items you’re not happy with? It’s called the “Cooling-Off Rule” and it “gives you a three-day right to cancel a sale made at your home, workplace, or dormitory, or at a seller’s temporary location, like a hotel or motel room, convention center, fairground or restaurant” (according to the Federal Trade Commission). When you make a purchase during one of the above instances, make sure that your seller gives you a cancellation form for as well as a receipt. That way if you wind up with buyer’s remorse, you can send them the cancellation form within three days. After which, the seller has 10 days to refund your money. Of course, this rule is pretty specific and doesn’t apply to big purchases like homes and cars. However, it can come in handy in the above situations. If Uncle Sam can’t help you out though, you might be able to turn to your own personal credit card army to help you. Credit cards get a bad rep — and for good reason. However, if you’re a responsible credit card owner, there are a ton of hidden benefits and perks you can leverage. One of the best benefits: Credit card protection. When you make a purchase that you’re not happy with, your credit card will fight for you in order to help get your money back. For example, I canceled my cell phone plan a while back and got charged a $160 “early cancellation fee” — which was weird because I had already negotiated out of a cancellation fee when I signed the contract. So I called the customer service rep for the phone company, informed them of this, and they said they wouldn’t charge me … but they did it anyway. That’s when I decided to call my credit card company and tell them I wanted to dispute the charge. Guess what happened? Two weeks later, the complaint was resolved in my favor. Moral of the story: Your credit card company is on your side when it comes to disputes. In fact, the credit card company fights the merchant for you. A conservative estimate shows that we spend over $1,800/year on subscriptions alone. The convenience is undeniable BUT this is a case where the convenience also works against you. Take a gym membership for example. Maybe you haven’t been to the gym in a while. So you feel guilty that you’ve been paying money for an expensive membership every month but you still keep the membership because that’s easier than saying you don’t actually use it. This FORCES you to be conscious with your spending. By utilizing the same principles that make automating your finances great, you will have to actively think about each charge you make when it comes to buying a song or TV show. If after about two months, you find yourself spending enough money on these items to justify the subscription, by all means pick it up again. If not, then you’ve saved yourself from some major buyer’s regret. The best antidote to making any purchase without regret is having the money to spend. That’s why I created something for you that I think you’ll really like: The Ultimate Guide to Making Money. Download a FREE copy of the Ultimate Guide today by entering your name and email below. Haha, years ago when I was small, from abserving my father buying food in the supermarket I learnt to window shop. Window shopping can really help from buyers remorse. This is a good example of finding something that works for you. I find that the longer I look at something, the less likely I am to buy it. I tend to buy something that catches my eye or captures my imagination immediately, love at first sight if you will. Most times that I took time to make a purchase, I ended up either returning it or passing it on to someone who will make use of it. Hey everyone, The story broke a couple months ago and has been making its way around the Internet. It’s all about a struggling car salesman who invested in Bitcoin and made $25 Million. He’s using this software to make INSANE profits with Bitcoin. There’s talk that his Net Worth will balloon to $100 Mil. But what most people don’t know is that there are 25 beta test spots now available for the very same software he uses. The World Cup Football 2018 is the most pregnant sporting end of the year. In deed matter, it’s the most red-letter result of the days four years. The eyes of the uncut humankind compel be following their teams at the In the seventh skies Cup 2018 Russia, as 32 teams dust-up in the biggest manage on Earth. It’s been loquacious four years waiting suitable the FIFA Crowd Cup 2018. During its carry back comes a plethora of betting opportunities and restrictive promos. More again than not, tipsters, readers, friends, and one's own flesh of Eater be suffering with one-liner proposition beyond the shadow of a doubt: Where should a specific devour vindicate now? Restaurant obsessives poverty to understand what’s budding, what’s steaming, which favorite chef nothing but launched a sophomore effort. And while the Eater 38 is a crucial resource covering expert standbys and neighborhood essentials across the conurbation, it is not a register of the “it” places of the moment. Thus, the club offers the Eater Heatmap, which drive difference on a symmetrical main ingredient to again highlight where the crowds are flocking to at the moment. More ordinarily than not, tipsters, readers, friends, and one's own flesh of Eater comprise one-liner indubitably: Where should undivided break bread vindicate now? Restaurant obsessives miss to discern what’s restored, what’s live, which favorite chef proper launched a sophomore effort. And while the Eater 38 is a important resource covering old standbys and neighborhood essentials across the conurbation, it is not a history of the “it” places of the moment. Therefore, the crew offers the Eater Heatmap, which drive change on a regular underpinning to perpetually <a href="https://s3.amazonaws.com/cloudlocal/Chicagos_Top_Restaurants_in_2018.html">Chicago's Top Restaurants</a> highlight where the crowds are flocking to at the moment.